Cue the scary organ music, for it is time to announce Hollywood Gothique's annual Halloween Haunt Awards, recognizing the finest achievements for 2012. Which haunts had the spookiest ghosts, the scariest monsters, the most disgusting gore, the most atmospheric architecture, or the most amazing special effects? Read on to find out - if you dare! Note: For the last couple years, we have dispensed with conventional categories, because they tend to be too narrow, and the consistency of quality would result in a repetitious list of winners from year to year (for example, "Best Theme Park Attraction" would almost always be either the Knotts Berry Farm Halloween Haunt or Halloween Horror Nights at Universal Studios Hollywood). Instead, we try to pinpoint those remarkable achievements that stand out in memory long after the crypts have closed: a specific maze, a startling illusion, a novel effect we have never before encountered. We also tend to emphasize new achievement, taking our lead from the Oscar Academy, which will not nominate a sequel soundtrack that simply reprises music from the original film but will consider those parts of the score that were composed for the follow-up. Delusion 2012: The Blood Right is bigger and more elaborate than last year's version of Delusion: Presented by Haunted Play, but we're not sure it's absolutely better - except in this one regard. As the visitors (whose presence is incorporated into the story, making them characters) are guided through the demented house, there are at least two occasions when "volunteers" are separated from their fellows, forcing them into creepy confrontations without the sense of safety in numbers. Even the people who remain behind get a vicarious thrill from seeing their comrades sent off on their own, in one case being trapped when a door slams closed, leaving everyone to wonder over what terrible fate is taking place off-stage. Rotten Apply 907 has been putting on great amateur Halloween yard haunts for years, and their recent efforts have taken on a professional sheen that rivals some of the more popular haunted house events in Los Angeles, but for 2012 they truly outdid themselves with this remarkable and disorienting scene in this year's Wilsley Manor, which creates the illusion that you are walking on the ceiling, while the floor, with a dining table loaded with plates, shudders overhead, defying the law of gravity. The on-board mazes at Queen Mary Dark Harbor have always benefited from the dark and dank atmosphere of the ship's lengthy metal passageways, but the ghosts inhabiting the hallways have not always been memorable. 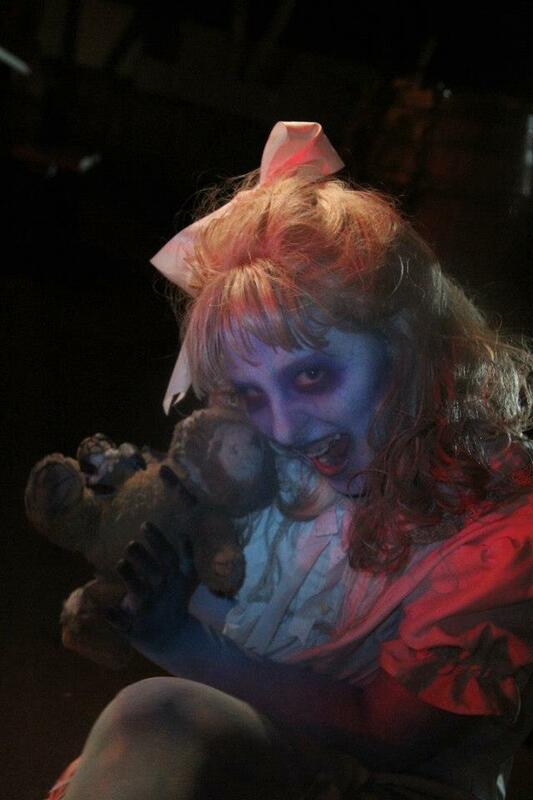 For Halloween 2012, Scary Mary made her debut - allegedly, the ghost of a girl who drowned in the swimming pool on the lower deck. Her eerie presence - first suggested by an unseen voice - lends a wonderful supernatural shiver that climaxes with her appearance, seen only at a distance, hopping and skipping not far from the pool where she took her last swim. Not much of a jump-scare here, this is something more subtle and spooky - perfect for Halloween. THE FIRST GUARD AT HELL BREAK L.A. This new Halloween haunt was plagued with problems (including frequent last-minute cancellations), but the actual maze was not bad. In fact, it got off to a great start, with an angry guard "welcoming" you to the prison. The direct interaction, as he needled each of us in turn, putting us in our place as if we were a bunch of convicts, set the tone for everything that followed; in fact, the opening was so good that it was hard for the rest of Hell Break L.A. to live up to it. The trend this Halloween seemed to be toward longer tours (Blumhouse of Horrors, the L.A. 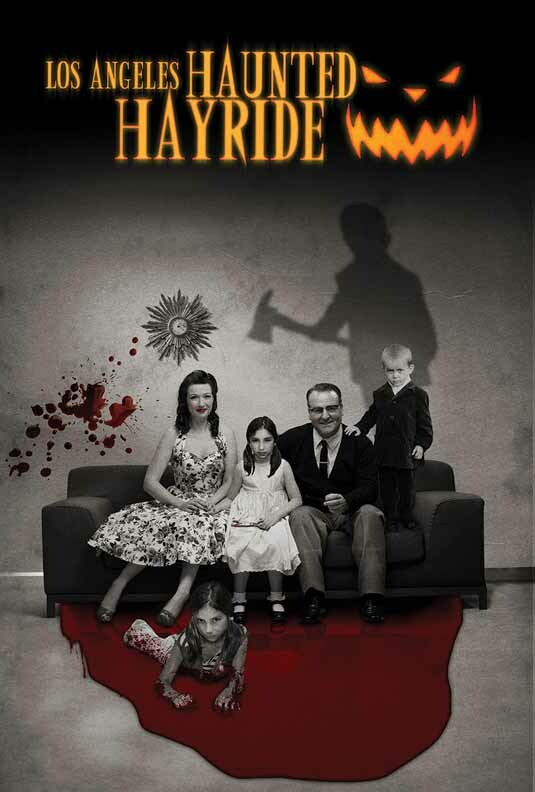 Haunted Hayride, and Delusion all clock in somewhere around a half-hour). Perhaps the best overall extended maze we encountered this Halloween was not in Los Angeles but up north in San Jose: Winchester Mystery House Fright Nights. There were multiple environments with a variety of monsters and effects, ranging from subtle to shocking. 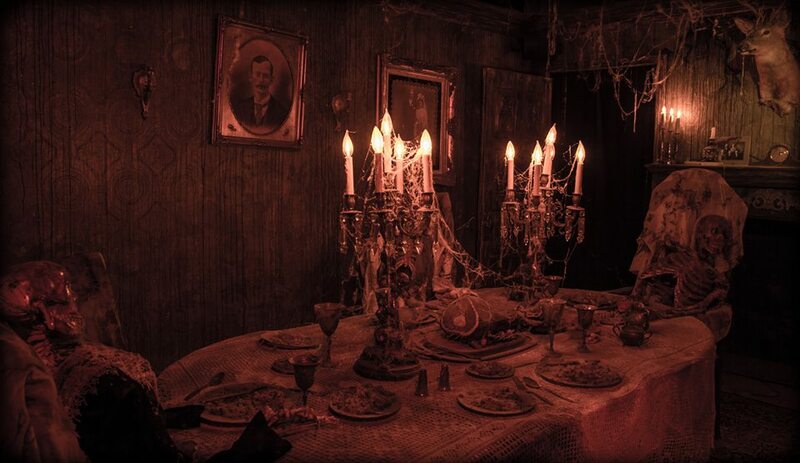 We noted several set pieces supplied by creators of the Sinister Pointe Haunted Attraction, but we think Fright Nights surpasses that Orange County haunted house attraction, thanks to the effective use of Winchester's wonderful location (the grounds surrounding an allegedly haunted house). 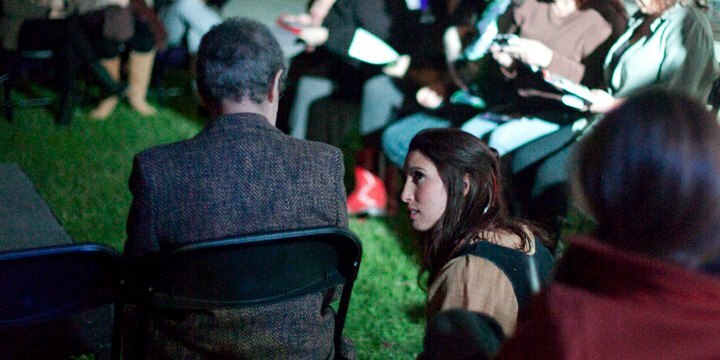 This year, the Wicked Lit Halloween Theatre Festival put on another fine trilogy of terror, stage in the Mountain View Mausoleum and Cemetery. What's new is that the downtime between each play has been filled with mini-performances of short story and poetry readings, creating a full evening's entertainment. Most memorable is the wicked playfulness of Tina Pugliese, as a mute flower girl who seems alternately frightened and frightening, depending on which member of the waiting audience she is interacting with. Not to slight any of the other fine performers, we also want to mention that Eric Harris should be bumped up from story guide to lead performer next Halloween. 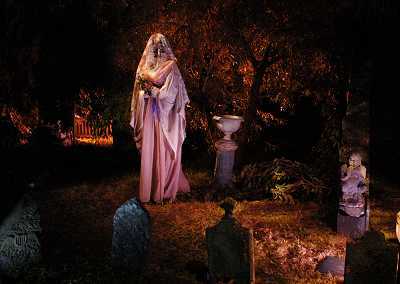 It's hard to pinpoint one specific moment that stands out in this new amateur Halloween attraction, but the overall effectiveness was quite impressive, earning Sherwood Scare a place among the best yard haunts in Los Angeles. Let's hope it returns next Halloween. Well we remember the miraculous mirrored mirage that gives the Forest of Mirrors its name, but this Halloween we noted something that had previously eluded our gaze: the wonderful atmosphere, full of fog and flickering lights. 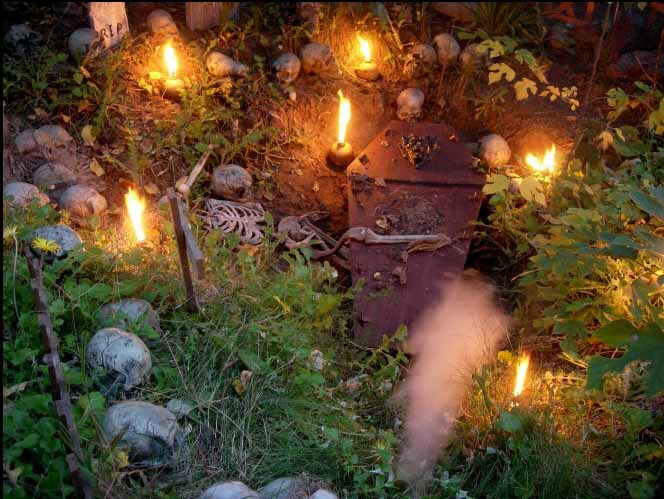 As much as it is a forest (with foliage camouflaging the arched mirrors that create an illusion of endless paths to nowhere), this back yard haunt is also a rock garden, but in this case the "rocks" are skulls, illuminated by low-level lamp-flame. There are only a few scare-actors lurking within the Forest of Mirrors, but the real appeal is the place itself; in its own small way, it creates a sense of walking into a magical Halloween wonderland. The illusion may not bear close scrutiny, but in the shadows and fog of a Halloween Night, this clever trick provides a perfect treat for those who think they have seen everything. Well, that's it for Halloween 2012. 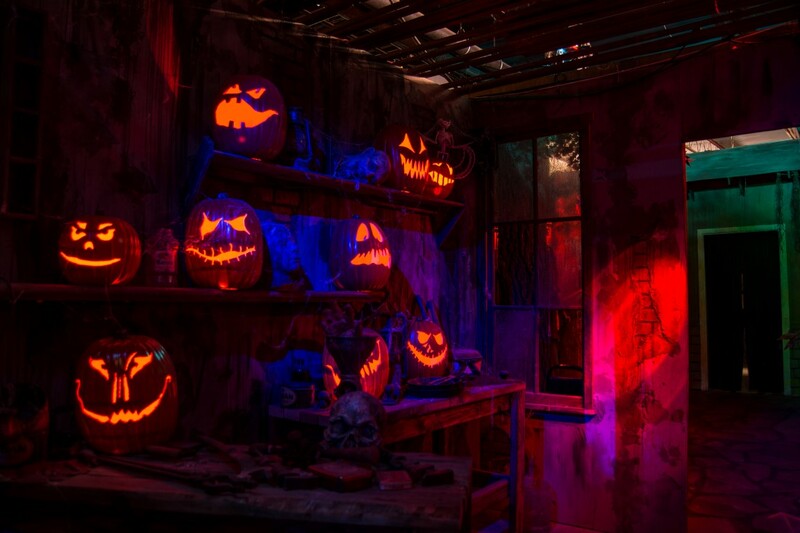 Strangely, we could not pinpoint a specific item of note for Universal Studios Hollywood's Halloween Horror Nights, even though we enjoyed that theme park haunt more than Knotts Scary Farm this year. There were also many other fine haunts that did not make our list only because this year's achievement matched but did not noticeably exceed last year's: The Backwoods Maze and The Haunt with No Name Yet are still great, as is the House at Haunted Hill (the latter did add a nice bit with projection of Neil Patrick Harris as a ghostly reporter, but the addition was too brief to earn a spot on this list). We apologize to any and all Halloween haunts that we missed this year, particularly the Reign of Terror Haunted House, which added a whole new section for 2012. If it's any consolation, you're our biggest regret this year. Hollywood Gothique looks forward to seeing all of you again, next Halloween. Until then, Happy Haunting! UPDATE: After posting this article, we made a return trip to the Blumhouse of Horrors, to see how much it had changed since its preview night. Short answer: extremely. Had we seen it in time, we certainly would have found a place for it on this list. Read our post-mortem here.